Watching the major marathons over the years, one gets the sense that the non-East-African athletes are seldom able to really contend because they’re moving so differently they almost seem like they’re not playing the same sport. In Chicago this year it was a different story. 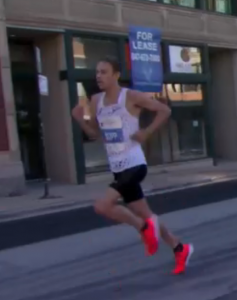 I was frankly amazed at Galen Rupp’s form in this race. He’s made some major changes since Rio, and in retrospect I think perhaps they were already underway in Boston. The first of these two pics is from Rio last year, and the second is from Chicago. 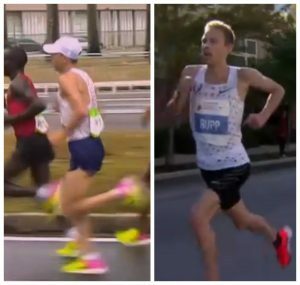 Though the angle is different and so is the part of the gait cycle, you can see that Rupp’s arms are now carried higher, the elbows more bent. His head is nicely forward without any tension in the neck or shoulders, and his back is much straighter than in Rio. His mouth and jaw look more relaxed and his breathing seems easier (though weather conditions likely play a role in that as well). I wrote after Boston that there was a noticeable—i.e. excessive—lift to his knees, but I did not see that at all in Chicago, as his weight moved forward better due to all the changes I’ve just listed. The nature of the race, with a large pack of men for a very long time, with Rupp buried in the middle, meant that his form had something of a dramatic unveiling close to the end of the race, at least from a TV viewer’s perspective. I had no idea how well he was running until he finally started really running. Kirui’s action is surprising. It couldn’t possibly be fast, and although his habitual armswing is asymmetrical and wide from his body, this large, sagittal movement he makes as he tries to stay with Rupp just slows him down further and is the polar opposite of what Rupp’s doing to run so fast. Kirui is that rare example of a runner with great legs who doesn’t get as much help as he could from his upper body and still runs well. At this moment perhaps he was reaching for a sprinter-type arm movement to give him extra speed. Whether a purely sagittal arm movement really works well for sprinters is something I seriously doubt but that’s not my field. It will never work for a marathoner. Refer to Kipchoge, the master, in my Berlin analysis. That’s what speedy arms look like, and Rupp’s been studying it well. In fact, at around this point in the race one of the commentators shares a conversation he had with Rupp’s coach, Alberto Salazar, in which Salazar shared that Rupp’s been working on keeping his hands closer to his chest—it’s more efficient and it’s what all the East Africans do anyway. 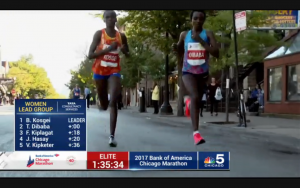 After the disappointment of not seeing much of Tirunesh Dibaba in the London marathon due to Mary Keitany’s huge lead, Chicago offered a feast of Dibaba-watching by the same mechanism. Oddly, the camera on the women later in the race was positioned very low, close to street level, looking upwards at the runners from the front. I’ve never seen that camera angle before; it was a really informative one for watching Dibaba. Though I rarely had the opportunity to see her from the side, this front shot of Dibaba and Brigid Kosgei’s makes it clear that the former has her usual organization of head pulled slightly backwards and her chin a bit down. While that observation isn’t anything new, what I could see about the relationship between that, her arm action, and her feet was. I’d never noticed before, but Dibaba’s footstrike is strongly supinated—so strongly that her first steps after crossing the finish line were entirely on the outsides of her feet…and those were walking steps. It’s not just a foot thing. She slightly internally rotates each leg as it swings forward of the stance leg–both lower and upper leg. This is the counterbalancing lower body action for the very large lateral action of her armswing—lateral meaning that it moves her upper spine and ribs a great deal side-to-side. And in fact it lifts the swing side of the pelvis, creating a stronger downward push through the opposite side. This is very different from internally rotating the leg in stance, which makes people shriek “overpronation” and reach for the stability shoes. 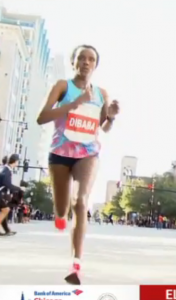 I see little sign of that in Dibaba’s running. I was reminded of Mare Dibaba, who does the same thing but even more so, and without retracting her head. Check out this clip. Now I’ve said it counterbalances the upper body. Which comes first? I have no idea, nor do I think it’s a productive question. It’s a whole-body movement pattern, a distance-running contrapposto. It seems to work, doesn’t it? Lateral movements, though tiny relative to the sagittal movements of running, are very powerful as they are all about capitalizing on ground reaction force. Eliud Kipchoge and Usain Bolt both get a lot of power this way, though as I wrote in my Berlin analysis Kipchoge does it completely differently from either of the two Dibabas. Before Tirunesh took off, she was part of a group of five that included Jordan Hasay. Like Rupp, Hasay has made some significant changes in her upper body, especially her arms. Unfortunately I don’t have any clear screenshots in my Boston file that can be compared with Chicago—completely different camera angles and moments in the gait cycle. But recalling her lower, wider armswing in Boston, her more compact action in Chicago is quite a contrast. Form-wise as well as speed-wise, she belongs among the women she’s running with. However, it still looks like he’s using his arms strength more than his upper body movement. I love your race reviews. I can’t wait for your running analysis to come out after races! Thank you for all the time you put into them. I’ve been incorporating your running methods and they’ve helped a lot. Especially with my tight and painful hip and plantar fasciitis. I’m a sub 3 hr marathoner and triathlete and it’s nice to have a technique that allows me to stay healthier. Love all your videos. I could listen to you all day. Something calming and soothing about you that’s just nice to listen to. Thanks again! Jae, I think it’s cool that you analyze world-class runners as you do, but let me offer that to imply that running form is the difference between the winners and the losers is an oversimpflication. Sure, form is a variable in terms of performance, but there are so many variables in front of technique that are larger determinants of outcome.